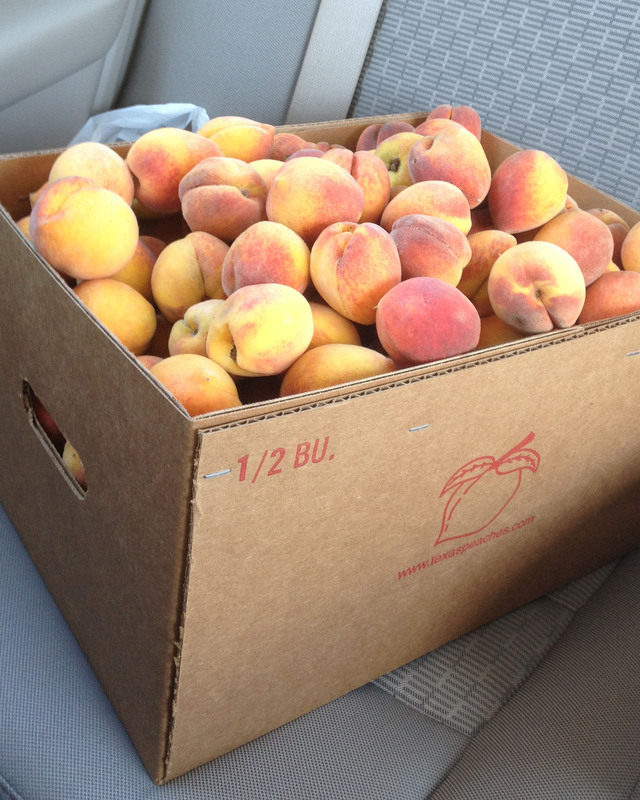 On our recent trip to Fredericksburg, Texas, the pilot bought me two kinds of peaches. One type were larger and easy to peel and eat. We ate all of those as they were VERY good. The other batch of peaches were much smaller. One of the fruit stands we went to had a 1/2 bushel of small peaches(very affordable) so we decided to cook with them. I love peaches and ate as many of them as I could before they started getting soft. The larger peaches really smelled like peaches, they were ripe and ready to eat. The half bushel on the other hand, were a little less ripe which gave us a few extra days. When I first smelled them, there wasn’t much fruit smell to them. When I put them down, the lady at the fruit stand tossed me one and said to try it. Much to my surprise, they were full of flavor. Yum. There are two parts to this recipe. The first part is a homemade crust and the second part is the filling. Go ahead and preheat the oven to 325 degrees. Here’s how to make the crust. Mix the flour and salt in a mixing bowl. Use a pastry cutter and cut in the shortening. Sprinkle with the water 1 teaspoon at a time as you stir it with a fork until the dough is a firm ball. Use your hands and squish the dough into a flat circle. Flour your cabinet so that it will not stick and then roll it with a rolling pin to about 1/8″ thick (making sure it stays round). You will then put it in a pie plate. Next is the filling. 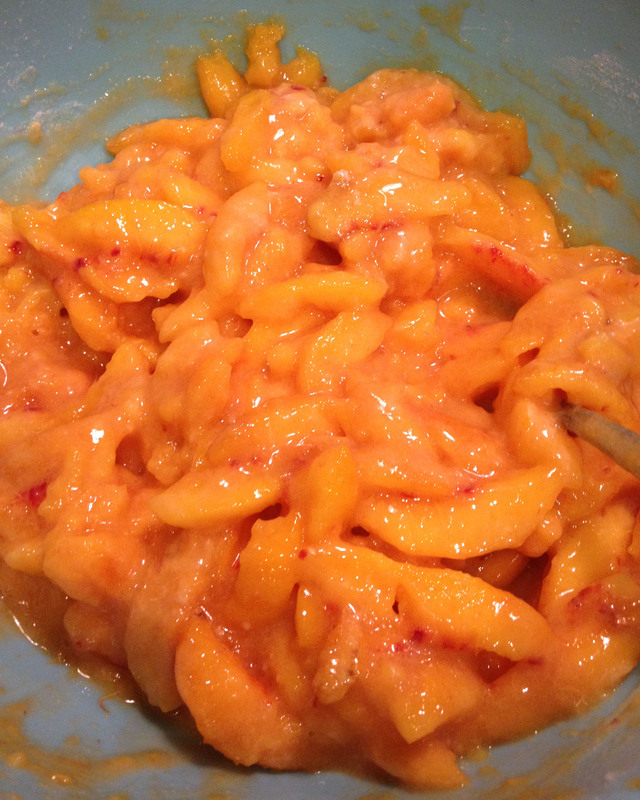 Mix the flour and sugar together and then put them over the pealed peaches. Mix the flour, sugar and peaches together in a bowl. 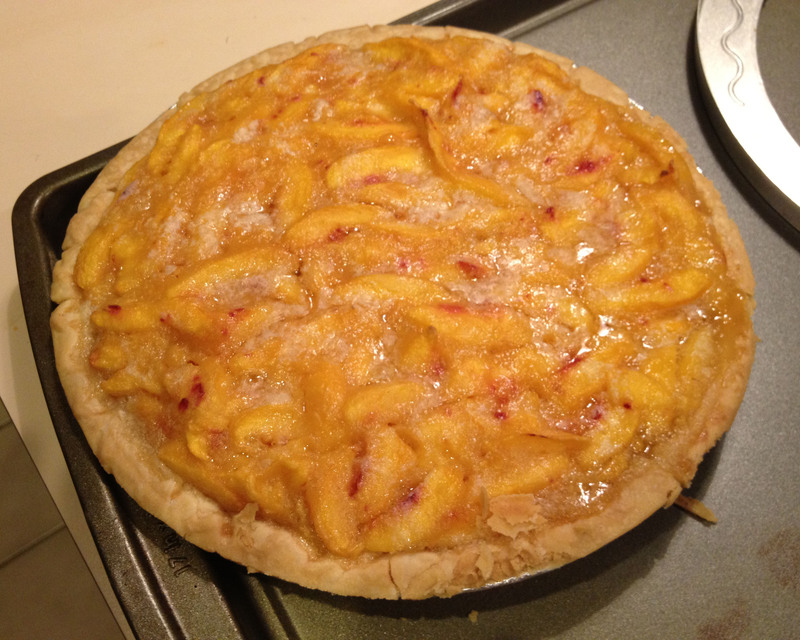 I found out why a 1/2 bushel of small peaches was so cheap, it took me an hour to peal and cut enough peaches for one pie. The small ones are worth it though, they tend to taste better. 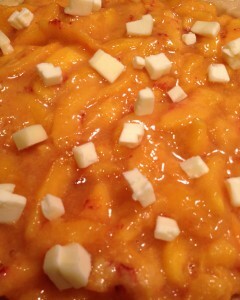 Make sure all the peaches are well coated with the flour sugar mixture. 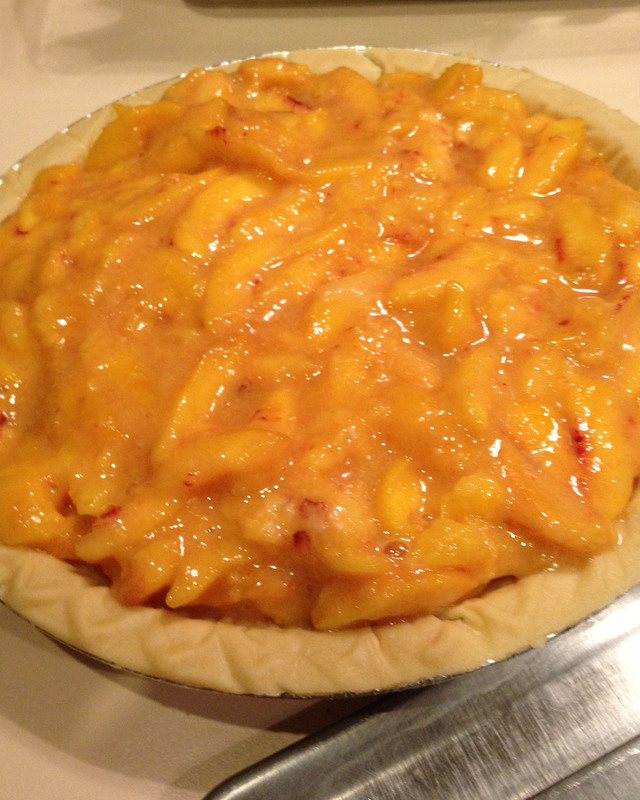 Then you will dump the filling mixture into the crust. Mound it up a bit in the center as the peaches will cook down. Cut up the 1/2 stick of butter into little squares, I usually slice them and then cut the slices into fourths. and sprinkle them on top. They will stick together so I usually put them on as I cut them. As you can see, some of mine still stick together. The pie is ready to go in the oven (325 degrees) for 45 minutes. BEFORE you put it in, set it on a cookie sheet, in case it boils over, so that it wont run all over the oven. After about 25 minutes cover up the crust with either tinfoil or a crust cover (found at your local kitchen store and pictured on the pie below). Cook for the remaining 20 minutes. 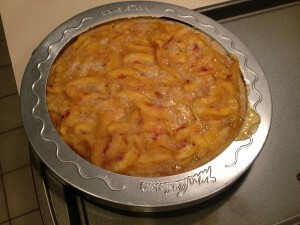 Pull it out and let it cool for about 15 minutes before serving if you don’t mind if the filling runs. If you want pretty pieces you will want the pie to cool completely before serving. With the fresh peaches the pilot gave the pie higher than usual marks. 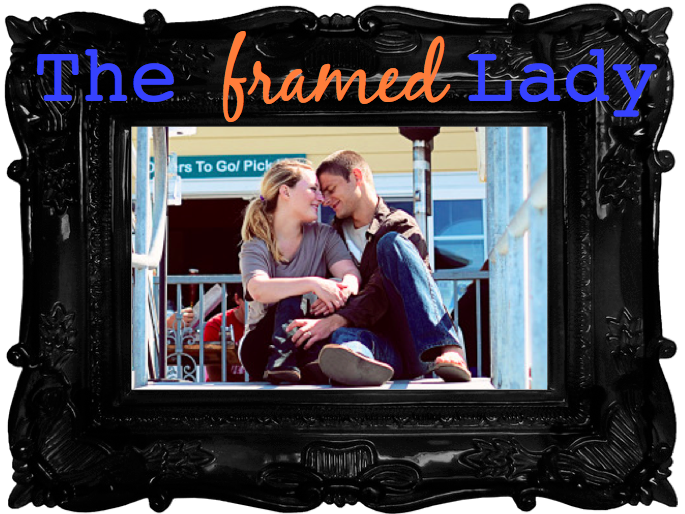 He rated it a 9.5 out of 10. Fresh fruit is really high on our list of good things to eat. Fresh peach pie tops the charts. If you give this recipe a try, post a comment on what you would rate it. I would love to know! He has been helping himself to things on the counter frequently but he might become an outside dog if he got himself in the pie…the pilot is not much for sharing when it comes to fruit desserts.